As the Sacramento legislature debates SB 32 to formally extend the state’s greenhouse gas reduction targets to 2030, a big piece of the political puzzle is the cap-and-trade program. Namely, will the Air Resources Board have authority to continue the program beyond 2020? The ideal situation, for boosters of the program, is that the legislature approves SB 32 with a two-thirds majority, which inoculates the program from any court challenges that it’s a “tax” or “fee” that requires a two-thirds vote under voter-approved amendments to the state’s constitution. Barring that (which seems unlikely this year but could happen next year if an anti-Trump “wave” sweeps away some of the legislators friendly to the oil and gas industry), the next option is to pass the 2030 goals with cap-and-trade via a majority vote. Arguably, the program is neither a tax or fee and therefore only requires a majority vote to enact. But a court would have to decide that outcome. So more uncertainty would result regardless. The third option is to simply carry on as usual under AB 32 authority, which the Air Resources Board is currently doing. 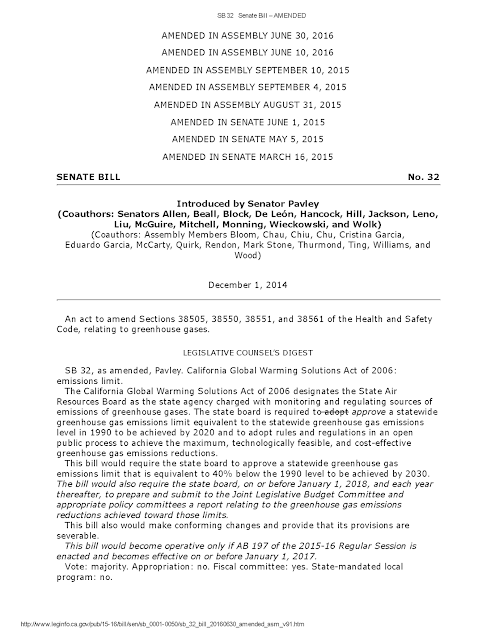 As my colleague Cara Horowitz at UCLA Law has described, there is a pretty solid argument that AB 32 provides all the authority that the Air Resources Board needs to continue the program beyond 2020, particularly with Governor Brown’s executive order to that effect. But that approach too will almost certainly require a court to sanction, leading to more uncertainty in the coming years. The final alternative, from a political standpoint, is to pass SB 32 on a majority vote, giving the Air Resources Board authority to issue command-and-control regulations to limit emissions from the oil and gas sectors. Presumably, the industry would much prefer a market-based approach to command-and-control, which would bring them back to the table with their legislative allies to re-authorize cap-and-trade beyond 2020. But who knows. And there’s also the wild card of the governor placing a 2018 ballot measure before the voters on the issue. One thing for sure: if the legislature does not resolve the situation soon, it will likely fall to the courts to decide.